Since 1993, when we began, Marabou has always considered itself a “partner” to our customers. It has been our mission to absolutely contribute to the profit and ensure the success of our customers. Marabou is reliable, competitive, and dependable. When this is combined with mutual respect and open communication, we will ALWAYS BE BETTER TOGETHER. David is the Co-Founder of Marabou and is jointly responsible for all aspects of business development, operations, marketing and admin for the Marabou companies. David has over 40 years of oil and gas, midstream and marketing experience, beginning with his family’s oil and gas E&P business in Midland, Texas. 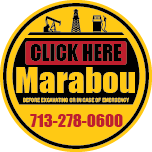 His last role prior to Marabou was VP – Trading and VP – Producer Services for CenterPoint Energy in Houston. David received his B.A. – Economics from Rice University.